Does your web store have many visitors, but most of them leave without a purchase? The good news is your e-commerce marketing strategy succeeds. The bad news is that your website probably has flaws that fuel customer distrust. Managing a web store is an ongoing process where web development is only a starting point. After that, merchants need to monitor customer behavior to understand their fears, doubts and preferences. Taken seriously, this knowledge paves the way to a customer-friendly web store. Backed up with e-commerce consulting experience, we talk about conversion killers other merchants have faced and present a list of seemingly minor e-commerce mistakes that keep potential customers away. Nobody will notice the spelling if it is perfect. But if you fail to create a grammatically correct e-commerce website, this can seriously affect sales. Not merely a claim, this fact finds the support of Charles Duncombe, an online entrepreneur who doubled the revenue having fixed a single spelling mistake. A website is the first point of the buyer-seller interaction. Responsible for earning customer trust, it can’t afford to push them away through carelessness. Bad grammar and punctuation affect the whole business giving ample reason to doubt its reliability and competence. To save customers from frustration and ensure typos don’t ruin conversion, merchants shouldn’t neglect proofreading and checking for mistakes. Just like the language, the color tells its own story. It can bring associations to life or evoke a range of emotions. Having a powerful tool in their arms, merchants may underestimate its impact on sales and turn it into an ecommerce mistake. Most commonly, owners of web stores rely on a light background theme. It makes text easier to read. The traditional combination of black letters on a white background minimizes eye fatigue providing optimal conditions for the reader. Besides, light colors don’t steal the show allowing viewers to focus on the information and products. If a treacherous idea to stand out and create a dark background has come to your mind, give it a second thought. Although making an ecommerce website look creative, such a design may result in eye strain and problems with absorbing valuable information. There is no single good solution for the color of CTA buttons. The main rule is to make these vital elements resonate with the overall look and feel of an e-shop. Meanwhile, testing of different colors will allow seeing their impact on conversion. Though red is one of the most popular choices for CTA, it may have a reverse effect on sales. A color of stop and danger signs, red may talk visitors out of clicking a button. Still, as it promotes a sense of urgency, it may work well for clearance sales. “Here are our best-sellers! Look at our new collection! What a promotion we have for first-time customers!” This is how an overloaded homepage looks for visitors. Instead of arousing their interest and guiding “inside” the store, it bombards them with information and hinders the search. E-commerce is a time-saving alternative to brick-and-mortar stores. People expect to find things on the internet quickly and without much effort. A cover for an e-commerce website, a homepage doesn’t need to outline the whole content. Making it less informative but eye-catching, sellers engage visitors to proceed with other sections and start shopping. The two words – sales tax – plunge merchants into despair. Not only US states have different tax rates, but there are counties, cities and even special taxing districts that should be taken into account. Seeing a product price in the catalog, customers may be frustrated later at the checkout when a sales tax is calculated. Merchants can inform them beforehand by including this information on the Customer service page. Notified that the prices displayed on the website do not include local sales tax, customers are less likely to abandon the shopping cart due to price issues. Taking a step back and looking at a website from the outside can be painful. It may turn out that efforts invested in e-commerce development and design not only fail to pay off but also decrease conversion rate. 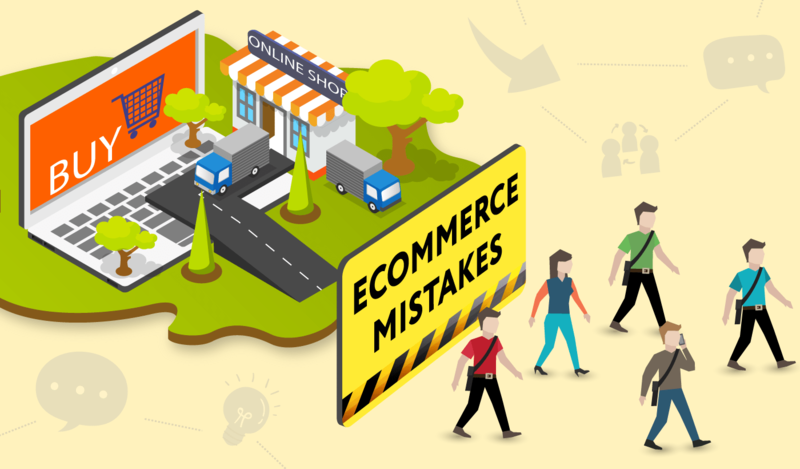 Being aware of possible e-commerce mistakes, merchants can better understand what people expect from web stores and improve theirs accordingly.